There were basis furniture inside like beds, tables, chairs and most important stuff is personal computer. 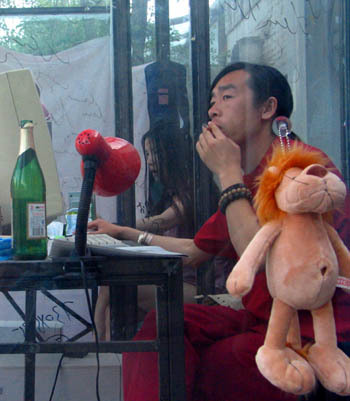 They spent their time in the glass house by surfing Internet, reading, eating, sleeping and other daily activities. Visitors can watch their every movement from the glass wall. Sometimes they were so bored and tried to have “contact” with the visitors by smiling and communicating by body language. This entry was posted on Tuesday, July 31st, 2007 at 12:48 am	and is filed under Interesting Stuff. You can leave a response, or trackback from your own site.